These are exciting times for Crowne Plaza Bahrain, one of the business brands in Intercontinental Hotel Group’s portfolio. Ideally located in the heart of business district, only steps away from the newly opened The Avenues mall, Crowne Plaza Bahrain offers spacious, well-appointed accommodations to business and leisure travellers. In May 2017, the hotel initiated a project to renew 140 rooms in the hotel. These selected rooms have undergone a complete renovation and are ready to receive its first guests in March. These rooms feature newly renovated interiors that have been tastefully decorated to reflect the vibrant urban charm of Bahrain’s business district. Stripped down to drywall, the guest rooms have been completely transformed, leaving guests with everything they need for an enjoyable and relaxing getaway. 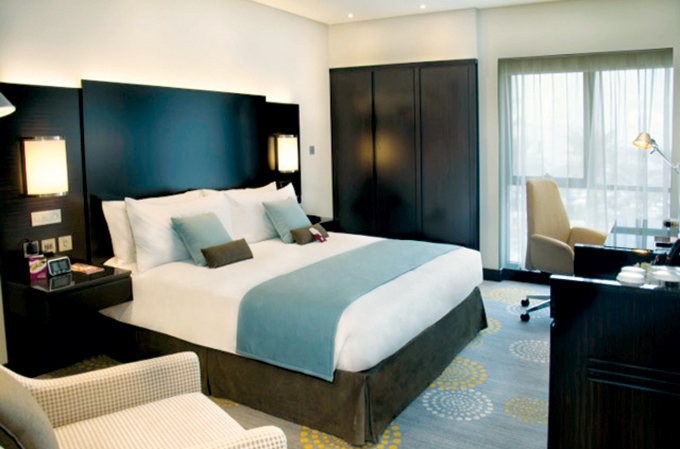 The new guestrooms and suites boast a spacious layout. A sleek, new design complete with hansgrohe’s latest state-of-the-art iBox universal thermostatic solutions in the bathrooms (first of its kind in Bahrain), interactive 43” smart televisions, brand new beds and airy window sheers, giving the rooms a whole new look and feel that compliments the hotel’s prime location. Guests will enjoy the modern furniture upgrades such as new workstations with media hub, built-in reading lamps and soft seating. The bathrooms have also undergone a complete makeover featuring bright, upgraded interiors and fixtures trimmed with new rain showers and lighting including a superior amenity package. The Crowne Plaza Bahrain’s brand-new Club Lounge will also be opening this month, coinciding with the launch of the hotel’s newly renovated rooms. Exclusive to the Club room and suite guests, the all-new Club Lounge has been designed with the concept of a new modern look expressing professionalism, efficiency and performance, as well as comfort, warmth and restoration. The general manager of Crowne Plaza Hotel Gilles Nicolas stressed that the aim of the comprehensive renovation of the hotel rooms is to keep pace with the market and the strong competition that is witnessed, especially with the entry of new hotels, adding that the management of the hotel is always seeking to maintain the IHG and the hotel's status as one of the leading five-star hotels in Bahrain. He added, the world of work is changing and so too is our guest: today’s modern business traveller craves a hotel experience that blends work and restoration; they want to boost their productivity and feel inspired in the process.